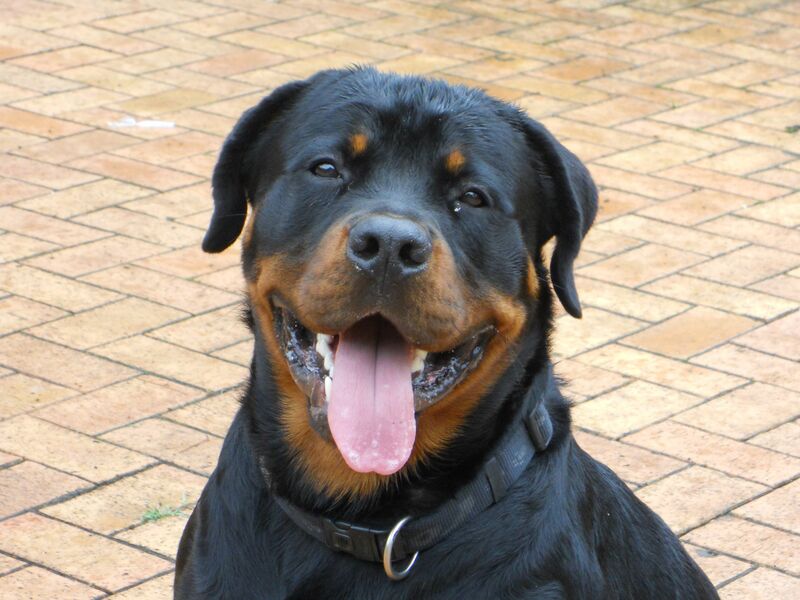 I have been training this very lovely 10 month old Rotti male for 6 weeks now and he is making great progress with his skills – and is learning some tricks too! Unfortunately he was never socialized as a puppy, and as a result is fearful of things such as small children and strange people. He lives in a large garden with an elderly female Rottweiler and two Scotch terriers and has two gardeners coming and going with whom he is on good terms as he has known them from puppyhood. Any strange person approaching him, however, make him anxious and fearful and he tends to growl and lunge. At the moment in his training we are spending time with a group of passive adult dogs as well as exposing him to different people in an unfamiliar, non-threatening environment. He desensitizes to adults fairly easily, but is still very fearful of small children. His owner contacted me yesterday for help, as he has just hired a painter to re-paint his home, and Jason was apparently behaving with huge aggression towards the man and had to be locked away. As the painter was to be on the premises for a number of weeks, something had to be done. When I arrived and let Jason out of his kennel I was greeted with huge enthusiasm as he hadn’t seen me for a week. We did some heeling and recalls with his lead on, and then went to look for the painter. With the clicker and treats we played Leslie McDevitt’s “Look at That” game and before long I could approach close enough to the painter (Alfred) so that he could toss some treats on the ground for Jason, with Jason eventually taking treats out of his hand. Alfred was instructed how to behave when Jason was in his vicinity by not making eye contact and not approaching him to touch, and particularly not to pat him on the head, as all these things made Jason uncomfortable. This entire exercise probably took 20 minutes. For another 10 minutes I walked Jason around in close proximity to where Alfred was working and observed carefully his reaction, which was calm and relaxed. I returned him to his kennel and returned later in the day to repeat the exercise. I was still not confident about leaving him alone with the painter and no supervision, so I once again put him in to his Kennel with instructions to the resident staff to let him out as soon as the painter left. As I was a little concerned about how Jason would react today with Alfred’s arrival at the gate, I arranged to be at the house at 7 a.m. to assist. (What we do for the love of dogs!). Jason was predictably anxious when Alfred approached the gate, but with clicks and treats for looking calmly allowed Alfred to enter the grounds with happy body language as soon as he recognised him. The owner and I monitored Jason’s behaviour around Alfred for about 10 minutes and after laying the ground rules again of not touching, and not making eye contact, decided to leave Jason out of his kennel. Apparently, there was absolutely no incident the whole day, and, I’m happy to say that although Alfred and Jason are not yet the best of friends, there is no reactive behaviour on Jason’s part, and Alfred is getting over his fear of the black, very large and powerful Rotti, Jason.